Doombands can be split up in two segments; the ones with the clean opera kind of vocals (like Candlemass) and the ones with the lower and grunting kind (like Paradise Lost, My Dying Bride). This Norwegian metal band belongs to the last category. This is their third album and I must confess that I don't know their first two. As a lot of other bands in this genre they produce very long songs, sometimes they go over the 10 minutes mark. So you get worth your money even with only 6 tracks on the album. The album gives me the same kind of feeling albums of bands like Anathema, My Dying Bride and even Paradise Lost did in their early days. Often I get bored when I listen to doom for too long and most of the time I loose interest after 3 or 4 songs, Syrach however keeps my interest longer. I think that is because of the tempo. Although it is definitely doom, the tempo in the songs is not too sloooooow and sounds less depressive as other doom bands. Also the guitar solos are very interesting and give just that bit of extras to the tracks. Singer Ripper sounds as a good combination of all the singers of the bands I already mentioned. 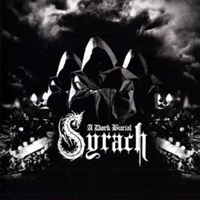 Syrach didn't invent a new kind of doom, so don't look for something very original, but the job they do is well done and with the nice guitar solos it is one of the better ones in the genre.